The DMCA provides a legal procedure by which you can request any Online Service Provider to disable access to a website where your copyrighted work(s) are appearing without your permission. There are two parts to the legal procedure: (1) Writing a Proper DMCA Notice, and (2) Sending the Proper DMCA Notice to FileFactory.com's Designated Agent. The Site is controlled and operated by Company from its offices in Belize. Company makes no representation that any of the materials or the services to which you have been given access are available or appropriate for use in other locations. Your use of or access to the Site should not be construed as Company’s purposefully availing itself of the benefits or privilege of doing business in country, state or jurisdiction other than Belize. These terms and conditions are governed by and construed in accordance with the laws of Belize. These parties submit exclusively to the laws and courts of Belize. Our Services are available only to individuals and business entities (including but not limited to sole proprietorships) in good legal standing that can form legally binding contracts under applicable law. Customer hereby represents and warrants that it is duly licensed to do business and is in good legal standing in the jurisdictions in which it does business (during the term of this Agreement), that it is not a competitor of FileFactory.com, and that the person agreeing to this Agreement for Customer is at least eighteen years of age and otherwise capable of and authorised to enter binding contracts for Customer. Subject to the terms and conditions of this Agreement, FileFactory.com makes certain Services available to Customer. For the purposes of this Agreement: (a) "Customer" (or "you") means the individual or business entity that is using or registering to use the Services, including its employees and agents; (b) FileFactory.com "Services" means those electronic or interactive services offered by FileFactory.com. FileFactory.com reserves the right to change or discontinue any of the Services at any time. You acknowledge that all materials (except those uploaded by users) provided on this Web site, including but not limited to information, documents, products, logos, graphics, sounds, images, software, and services (collectively "Materials"), are provided either by FileFactory.com or by their respective third party authors, developers and vendors (collectively "Third Party Providers") and the underlying intellectual property rights are owned by FileFactory.com and/or its Third Party Providers. Elements of the Web site are protected by copyright, trademark (including common law rights), and other laws and may not be copied or imitated in whole or in part. FileFactory.com, the FileFactory.com logo and other FileFactory.com products referenced herein are trademarks of FileFactory.com, and may be registered in certain jurisdictions. All other product names, company names, marks, logos, and symbols may be the trademarks of their respective owners. Customer represents and warrants that the information it provides in FileFactory.com contact information forms is true, accurate, current and complete. Customer agrees to maintain and update this information to ensure that it is true, accurate, current and complete. If, at any time, any information provided by Customer is untrue, inaccurate, not current or incomplete, FileFactory.com will have the right to suspend or terminate Customer's account and this Agreement. Customer may designate persons to act as its agents to use the Services, provided that each designated person has the legal capacity to enter into binding contracts for Customer. Furthermore, Customer represents and warrants that each person who registers under Customer's account is an authorised agent of Customer (an "Authorised User") who has such legal capacity. Customer is solely responsible and liable for any and all access to and use of the Services (including all activities and transactions) by any Authorised User and/or User ID registered under Customer's account, unless such access to or use of the Services is the direct result solely of the gross negligence of FileFactory.com. It is Customer's responsibility, through its systems administrator Authorised User, to set the appropriate access for each of Customer's Authorised Users. Customer is solely responsible for maintaining the confidentiality of Customer access information, i.e. account ID's and passwords of its Authorised Users, and are responsible for all activities that occur under your account. Customer will immediately notify FileFactory.com if Customer notices any activity indicating that Customer's account or data is being used without authorisation, including: (a) Customer has received confirmation of an order or orders placed using Customer's account which Customer did not place or any similar conflicting report; or (b) Customer becomes aware of any unauthorised use of any product or service related to its account(s). FileFactory.com will provide access to the Services and Customer's data to an agent of Customer ("Authorised Agent") who provides FileFactory.com with a notarised letter signed by an officer of Customer which letter shall include statements of authenticity, authority, and liability as required by FileFactory.com in its sole discretion. Customer expressly and irrevocably agrees that FileFactory.com may rely on such a letter and on the apparent authority of the person requesting access to the Services or to Customer's account. In no event will FileFactory.com be liable to Customer or any third party for FileFactory.com's reliance on such letter or such apparent authority. YOU EXPRESSLY UNDERSTAND AND AGREE THAT: (A) YOUR USE OF THE SERVICE IS AT YOUR SOLE RISK. FILEFACTORY.COM SERVICES ARE PROVIDED ON AN "AS IS" AND "AS AVAILABLE" BASIS. FILEFACTORY.COM AND ITS SUPPLIERS, TO THE FULLEST EXTENT PERMITTED BY LAW, DISCLAIM ALL WARRANTIES, INCLUDING BUT NOT LIMITED TO WARRANTIES OF TITLE, FITNESS FOR A PARTICULAR PURPOSE, MERCHANTABILITY AND NON-INFRINGEMENT OF PROPRIETARY OR THIRD PARTY RIGHTS. FILEFACTORY.COM AND ITS SUPPLIERS MAKE NO WARRANTIES ABOUT THE ACCURACY, RELIABILITY, COMPLETENESS, OR TIMELINESS OF OUR SERVICES, SOFTWARE, OR CONTENT; (B) FILEFACTORY.COM MAKES NO WARRANTY THAT (I) THE SERVICE WILL MEET YOUR REQUIREMENTS, (II) THE SERVICE WILL BE UNINTERRUPTED, TIMELY, SECURE, OR ERROR-FREE, (III) THE RESULTS THAT MAY BE OBTAINED FROM THE USE OF THE SERVICE WILL BE ACCURATE OR RELIABLE, (IV) THE QUALITY OF ANY PRODUCTS, SERVICES, INFORMATION, OR OTHER MATERIAL PURCHASED OR OBTAINED BY YOU THROUGH THE SERVICE WILL MEET YOUR EXPECTATIONS, AND (V) ANY ERRORS IN THE SOFTWARE WILL BE CORRECTED; (D) ANY MATERIAL DOWNLOADED OR OTHERWISE OBTAINED THROUGH THE USE OF THE SERVICE IS DONE AT YOUR OWN DISCRETION AND RISK AND THAT YOU WILL BE SOLELY RESPONSIBLE FOR ANY DAMAGE TO YOUR COMPUTER SYSTEM OR LOSS OF DATA THAT RESULTS FROM THE DOWNLOAD OF ANY SUCH MATERIAL; (E) NO ADVICE OR INFORMATION, WHETHER ORAL OR WRITTEN, OBTAINED BY YOU FROM US OR THROUGH OR FROM THE SERVICE SHALL CREATE ANY WARRANTY NOT EXPRESSLY STATED IN THESE TERMS AND CONDITIONS. You agree to defend, indemnify, and hold harmless FileFactory.com, its affiliates, officers, directors, employees and agents, from and against any claims, actions or demands, including without limitation reasonable legal fees, alleging or resulting from your use of the Service, or your breach of this Agreement or other FileFactory.com policies, terms and conditions. Your use of FileFactory.com is at your own risk. If you are dissatisfied with any aspect of our Service or with these terms & conditions, or any other rules or policies, your sole remedy is to discontinue use of the Service. You expressly understand and agree that FileFactory.com shall not be liable for any direct, indirect, incidental, special, consequential exemplary damages, including but not limited to, damages for loss of profits, goodwill, use, data or other intangible losses (even if we have been advised of the possibility of such damages), resulting from: (i) the use or the inability to use the Service; (ii) the cost of procurement of substitute goods and services resulting from any goods, data, information or services purchased or obtained or messages received or transactions entered into through or from the Service; (iii) unauthorised access to or alteration of your transmissions or data; (iv) statements or conduct of any third party on the service; or (v) any other matter relating to the Service. We reserve the right to change this Service Agreement at any time without notice. We also reserve the right at any time to modify or discontinue the Service, temporarily or permanently, with or without notice to you. You agree that we shall not be liable to you or any third party for any modification, suspension or discontinuance of the Service. You acknowledge that we may establish general practices and limits concerning use of the Service, including the maximum disk space that will be allotted on FileFactory.com's servers on your behalf, and the maximum number of times (and the maximum duration for which) you may access the Service in a given period of time. 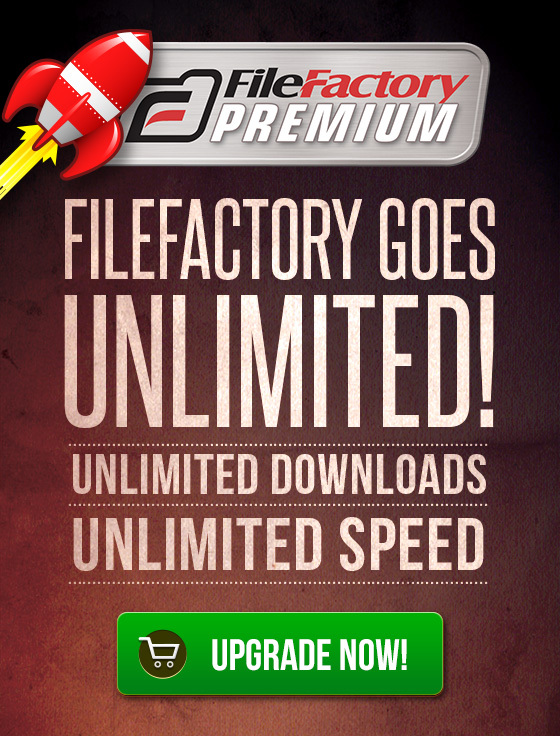 Further, you acknowledge that FileFactory.com may change subscription fees at any time without notice. Changes in subscription fees will take effect on expiration of any existing Customer subscription. 13.1 Without limiting other remedies, FileFactory.com may immediately issue a warning, suspend (i.e., lock out access and operation of Services for Customer) either temporarily or indefinitely, or terminate Customer's account and refuse to provide Services to Customer if: (a) FileFactory.com believes that Customer has violated or acted inconsistently with this Agreement, or any of our policies; or (b) Customer has failed to pay fees or other payments due to FileFactory.com; or (c) FileFactory.com is unable to verify or authenticate any information Customer provides to FileFactory.com; or (d) FileFactory.com believes that Customer's actions may cause legal liability for Customer, FileFactory.com's other clients, or FileFactory.com. FileFactory.com may also in its sole discretion and at any time discontinue providing the Service, or any part thereof, with or without notice. You agree that any termination of your access to the Service under any provision of these terms and conditions may be effected without prior notice, and acknowledge and agree that FileFactory.com may immediately deactivate, archive or delete your account and all related information and data and/or any further access to such data or the Service. Further, you agree that FileFactory.com shall not be liable to you or any third-party for any termination of your access to the Service. Upon termination of this Agreement by either Customer or FileFactory.com, all of Customer rights under this Agreement, and FileFactory.com's provision of Services, will terminate immediately. 13.2 The Sections 7 ("Customer Data"), 9 ("No Warranty"), 10 ("Indemnity"), 11 ("Limitation Of Liability") and this Section 13 will survive any termination of this Agreement. Where you elect to purchase Premium Services, we will bill you for the Services in advance. All purchases of Services through the Site are nonrefundable prepayments for Services. As such, there are no refunds available to customers. If you sign up for a FileFactory 30 day recurring Service, your subscription continues to bill monthly until you cancel it. To cancel a recurring credit card subscription simply visit your Account page on FileFactory.com. Once you cancel your subscription your Services will continue through the period you have already paid for. Once that period expires your account will be returned to a non-premium account. If any controversy or dispute arising from or relating to this Agreement, your use of the Site, the Services provided to you by Company, or any other matter related to the relationship between you and the Company, even if arising after termination of this Agreement, cannot be resolved through mutual agreement, the sole means of resolving the controversy will be binding arbitration under the auspices of the Belize Arbitration Act. The arbitration award may be enforced as a judgment by a court of competent jurisdiction. This arbitration provision will apply to all disputes between us relating to the services provided to you and alleged infringement of your copyrights or other intellectual property on or through the Site, and will survive termination of our relationship and this Agreement. You also acknowledge that you understand the consequences of agreeing to binding arbitration, including that you giving up any and all constitutional and statutory rights to have disputes between us, including copyright infringement disputes, determined by a court of law or equity or by a jury; that discovery of information in arbitration may be limited; and that the arbitration decision will be final and binding, except to the limited extent that law provides for judicial review of arbitration proceedings and decisions. If any provision of these Terms is held to be invalid or unenforceable, such provision will be enforced to the greatest extent possible and the remaining provisions will remain in full force and effect. Headings are for reference purposes only and in no way define, limit, construe, or describe the scope or extent of such section. FileFactory.com's failure to act with respect to a breach by Customer or others does not waive FileFactory.com's right to act with respect to subsequent or similar breaches. No action by Customer arising under this Agreement may be brought at any time more than twelve (12) months after the facts occurred upon which the cause of action arose. Customer and FileFactory.com are independent contractors, and no agency, partnership, joint venture, employee-employer or franchiser-franchisee relationship is intended or created by this Agreement. Operation of our Services may be interfered with by numerous factors outside of our control and we shall not be liable to you for any delay or failure in performance under this Agreement resulting directly or indirectly from causes beyond FileFactory.com's control. You represent and warrant to FileFactory.com that (a) you are not a competitor of FileFactory.com, (b) you shall keep publicly unannounced information and materials pertaining to FileFactory.com, pre-release software, testing or testing procedures strictly confidential and (c) you shall not use any information gained from access to the FileFactory.com Web site or use of the FileFactory.com Services to compete with FileFactory.com in its business. Any questions relating to our Legal Agreements and Policies may be directed through our online form.